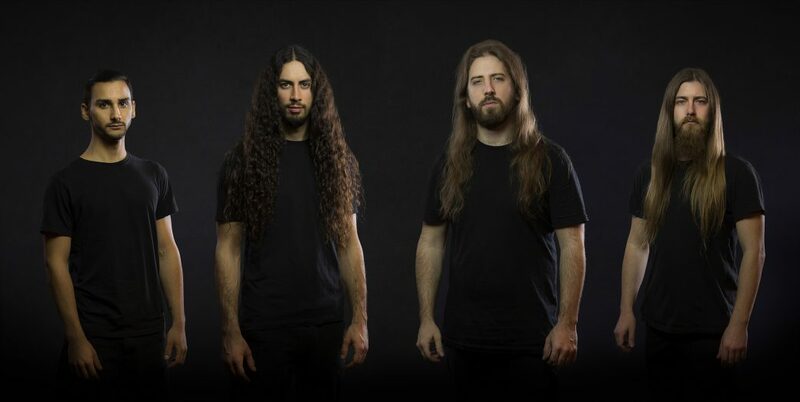 On October 12th, the Canadian progressive technical death metallers Beyond Creation will release their new album, called Algorythm. DutchMetalManiac’s Tim van Velthuysen recently spoke with Beyond Creation’s Simon Girard about the new album, their recently announced tours and some other things. Hey, congratulations with your new, upcoming album, Algorythm. It sounds very nice! This is your first album with Hugo Doyon-Karout on bass. How was working on an album with him compared to doing that with your bass player until 2015, Dominic Lapointe? Hugo is a really talented and super nice guy, so it was really efficient. We had a lot of fun creating the bass parts. He works really hard. Of course, Dominic did a really awesome job on the first two albums and Hugo of course wanted a similar kind of bass playing. Beyond Creation has a lot of accents on bass as an individual instrument and key instrument, it’s a really important thing for us. We’re really glad to have Hugo with us and he is a really good bass player. Was there something different in the writing process? Well the internet and the pre-production really helped a lot. With Dominic, I went to his place to play the songs and we could work the the bass parts together. With Hugo it was a little bit different, because I was able to send him all the songs which I recorded at my house. So, he could work on these tracks before I went to his place. Then after we changed a few things and I explained what I was looking for in each section a bit more detailed. It was kind of more fast and efficient. In a good way, I understand? The lyrics on Algorythm are English, except for Entre Suffrage Et Mirage, which is in French. Was there a specific reason for this and, if yes, what was that reason? I like it of course and because it is our everyday language, because we are French-Canadian. French is not a language that is used everywhere in the world but that’s what defines us so it kind of feels important to me to keep some French lyrics in all albums. But why don’t you do everything in French then? Because of course English is a universal language which pretty much everyone can understand and I also like English. Explaining things feels a bit different in English and it gives a different feel. I like doing both, because of the differences it can give. Is there a specific reason why you chose that track to do in French? No, not particularly. I take some songs and write specific lyrics that I have in mind. After that I can see if it flows right with the tracks. At the beginning that song was not supposed to be French. In terms of numbers of words and how I can relate to it, it felt more comfortable to do this song in French, so that’s why it ended up to be this one. Three tracks on Algorythm, Disenthrall, À Travers Le Temps Et L’Oubli and The Afterlife, features guest musicians Louis-Pier Racicot (violin), Olivier Caron (cello) and Louis-Philippe Beauchamp (French horns). What made them the right persons for these jobs? Actually, Louis (Racicot) is a good friend of us since high school and he’s playing in Cavalia. It’s a circus in which he is a violinist and he’s been touring around the world since I think 5 or 6 years now. I really like his playing, he’s a really talented musician. I decided to ask him if he wanted to play and record the violin on those tracks and he was really excited about it. Olivier is one of his friends that toured with him in Cavalia. We just got in contact before the recording process and he was also excited to be part of this record. Finally, the French horns-player is part of the family of my guitar teacher in college. My teacher introduced me to him and he was interested. That’s how I found the right people to play the orchestra on the album. You also have another guest, on the track The Inversion, which is Youri Raymond of Unhuman doing vocals. How did this collaboration come to pass? On the first record, The Aura, he already sang on Le Détenteur, a French song. Youri is a good all-time friend of us, he plays in Unhuman and he is one of the really good singers that I know personally, probably the best. It feels good to have him back on that track. The cover of Algorythm is very nice. Can you tell us something about the story behind the title and the artwork? Actually I was looking to get something different and everyone was feeling the same. We wanted the visual effects to be different than the first two albums. We like the sci-fi kind of feeling, because we talk a lot about the future. So, I found this imagery that is made by Tierno Beauregard. He is a guy from France and does graphics for videogames. I contacted him and he was really happy to collaborate with us, he already knew our music. That’s pretty much how we ended up with this artwork. About the meaning of Algorythm, an algorithm can be seen as a mathematic kind of process, but on this album I used algorithm more in its physical way. Algorithms are pretty much everywhere in every situation. Humans, nature, animals are all made of complex algorithms. It all is really well-calculated. People also create their own routine and way of living, so that we have a balance in everything. That’s like creating your own algorithm. Finally I ended up changing the “i” to make it Algorythm. Because of course I wanted it to relate with music. Another reason was that each album and song is different. I wanted to explain that through every album you create a specific algorithm to be noticed. Beyond Creation exists since 2005, so that’s already thirteen years now, how do you look back at those years? We really work hard and have a lot of fun, because the main reason to play music is to have fun. Creating music is a really nice thing in life, it really shows your feelings. It’s easier for me to speak with music than to speak my own feelings. Composition is a really complex thing, but a really fun process. I think by doing it right, people can relate to it. People can understand your feelings and see that you play with fun and that you feel what you play. When I look back at those years I think we had, and still have, much fun. Being challenged is a really nice thing, it gets you better and makes you keep pushing your boundaries. That’s where we are right now, we keep working hard and have a lot of fun. Any advice you would like to give to young and starting bands? Just do things with your heart. It’s really important like I already said before that you feel that you play because you like it. You don’t play music just for being musician or because of the side-effects of being musician. You play music because you like and want it. People will understand, see and feel it that the main goal is to give something to fans. You’ve a feeling that they can receive in their own life. They may feel it differently than you, but of course it’s the most important thing to give them those feelings. Keep pushing hard. How do you think your life would be without music? I really don’t know, I never thought about this. It’s the most important thing that I created and shared with people over the years. I honestly don’t know. I don’t really understand how people can say that they don’t really listen to music at all. I think it’s pretty much impossible to not like music, with all those kinds of music. You can’t be insensitive to whatever music. I would of course do photography, because I also am a professional photographer. Without music I would probably spend all the time photographing. What would be your ultimate wish for Beyond Creation for the future? It’s hard to say, because every little step is kind of a huge step in terms of advancing and progressing the band. Progress normally doesn’t go in huge steps, mostly it goes in many little steps. So I think it would be creating more music, having some feedback from fans and of course getting more reach, because the main reason why we do this is to provide feelings. I hope that there are more people over the time that will listen to progressive technical death metal. It’s a really nice genre that expands music, because it has all those variations and textures in it. I really wish that more people will listen to this genre over the years. You recently announced an North-American tour as well as European tour, looking forward to those? Yeah, of course! Touring North-America has been pretty much two years ago, so it would be really cool to get back. We are really good friends with Obscura and Archspire and we also know the guys from Inferi a little bit. So, it will be a nice package, also including Exist. The European tour will be the first official tour of the new album, Algorythm. We have a brand new live setup with visual effects and stuff like that. So we will keep pushing boundaries in every aspect of the band. Really looking forward to those tours. Can you already tell something about what fans can expect regarding the visuals? Well, of course the new album has a different atmosphere compared to the previous two albums. People would still hear the Beyond Creation signature. We will play a lot of the new stuff in that new atmosphere. When you compare the North-American audience with the European audience, what differences do you see? Every place is different, we really like playing every city. Of course in some cities you receive more energy from the fans than some other cities. Both continents have their places in which you receive more. So, I don’t think it’s really different from one to the other. Every city is specific and different. Are there any other future plans for Beyond Creation you can already tell us something about, besides releasing the album and those tours? Well, unfortunately we can’t say anything about next year, because it isn’t announced yet. However we have some really nice and big plans for next year, which we are starting to work on right now. For this year we will have our release-show in Montreal when we come back from Europe. That will be a really nice show for us, because all our friends, family and fans that we know will be there. We play with Black Crown Initiate from the USA, First Fragment and Brought By Pain, who are also on the European tour. It will be really awesome. Other than that we still work on improving everything on the show-side during the tours. It will be a busy year. Anything special planned for the release-show? We of course have a few surprises. We can of course already play the new album and experiment with sets with our European fans. So at the release-show we already played it a few times, so we will feel more confident about it. Thanks for your answers! Is there anything you want to say to DutchMetalManiac’s readers? We want to see you soon and are excited to play our music for you. Thank you so much for your time and interest in Beyond Creation, that’s really cool. We are looking forward to releasing the album and getting people listen to what we’ve created. It’s a really nice thing for us to finally release this new album.